Whose Turf is This Anyways? Almost a decade ago the Los Angeles City Council unanimously endorsed the Downtown Strategic Plan (DSP). Within a short time, Mayor Bradley completed his final term of office, the District Councilwoman apparently forgot her own participation in the development of the plan, the General Manager of the Community Redevelopment Agency was replaced, the principal of the Central City Association retired, and the planning consultants completely departed, taking up their next assignments elsewhere. Despite all of this, the DSP influenced the review of new projects, the development of follow-up plans in South Park, the Ten-Minute Diamond Civic Center plan, and more recently a plan sponsored by the Central City Association. Fundamental objectives regarding the production of housing are being implemented at an astounding rate. A series of major projects appear to have the catalytic impacts the plan encouraged. And downtown is no longer considered forlorn and hopeless. Of course, the irony is that few people actually refer consciously to the DSP, and it is actually out of print so that copies are hard to obtain. Thus development interests go forward without knowledge of the plan and CRA staff may have forgotten its existence. Staff in the city?s Planning Department may have forgotten its existence as well. 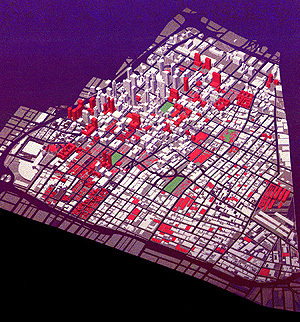 Yet the shape of downtown mirrors closely the intentions and strategies of the DSP. How can this be? The Downtown Strategic Plan Advisory Committee took several key positions early in the planning process. The first strategy was to understand what already existed and build from existing strengths rather than to begin with the imposition of bold ideas. 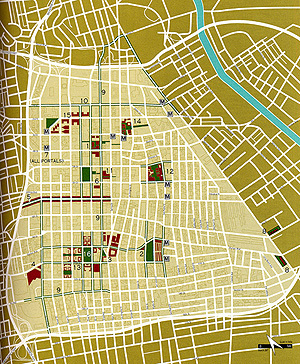 The Committee realized that downtown had a number of distinct and thriving districts, but they were disconnected from each other and not well enough known either by downtowners or by the general public. The second strategy was to expect development from the private sector instead of from government leadership or funding. Los Angeles is not well known for great civic leadership, but has been built largely by private initiative. And the third strategy was to build a downtown residential base since otherwise the working population of downtown had homes, interests, voting rights, and ambitions elsewhere. Every great downtown enjoys the energy and enthusiasm of its own residents, and the economic base such a resident population provides for the everyday life of shops and restaurants, services and entertainment, high culture and fringe experience. The three central strategies were accompanied by a series of other basic proposals for a safe and clean, economically competitive, and socially just downtown. Perhaps all of this has had only marginal influence. Yet what if the plan had followed the usual course of recommendations for sweeping change. There have been numerous such proposals for downtown. The prior Silver Book suggested such changes. Other plans by individual architects and groups have heroically postured the possibility of rebuilding downtown with bold strokes. Had the DSP proposed such a future, who would have carried it out? What mega-companies would have been recruited to own large pieces of downtown? And how many small properties would need to be assembled into the megasites of modernist centers? It is possible, then, that the DSP has been influential in two ways: first, it made good sense about central issues and has been used to good advantage, and second, it didn?t embroil downtown in adventures for quick fixes of the bold and glamorous kind. Its shelf life may be a rather long one, stimulating thoughtful initiatives from time to time. In any case, Downtown is off and running again whether the DSP has been a force or not. Now the new concert hall is open, and the music is glorious, and it is good that such a great thing happens where it should, at the center of the city. And yes, there is a center among centers where such places are especially welcome and appropriate. Downtown Los Angeles has for a very long time now been an economic engine for the rest of the city, providing revenues for services everywhere, employing hundreds of thousands in jobs of a wide variety of types and rewards. And it is where more and more people live. And a few heralded projects bring attention to the place not just to themselves. Some of those projects are disappointing. The Staples Center offers little urban amenity, and is entirely ordinary within. Pershing Square appears to have been forgotten by everyone who could enrich its life and quality, especially the Recreation and Parks Department. On the other hand, people from throughout the city continuously inhabit the Central Library, and its children?s programs are always popular and oversubscribed. The Cathedral has enough great qualities to overcome the Cardinal?s decision to put it at the edge of the town, almost alone in its place. The Asian American Museum and the transformations occurring in Exposition Park are now off the radar screen, but are excellent additions to our lives and to their places. Most of all, the many districts of the downtown are coming to life as people move into apartments and lofts as fast as conversions of older buildings can be completed and new housing constructed. As people move into Downtown, everything begins to change. The stores stay open a little later. The streets become safer. The hangouts, respectable and otherwise, are more numerous and enjoyable providing a social life that should be expected in a downtown. Small projects abound, including remodelings and refurbishings and fill-ins. Everyday life is better supported with markets and schools, even supermarkets and music schools, even architecture schools, and a barbershop. Several stores, not part of a global economy franchise chain, may actually stay in business. Such then is the context in which Disney Hall takes a place. It will not save the setting that needs no such salvation. We had heard that Staples Center would save downtown, and then it was the Cathedral, and now Disney Hall. And now we are told that some new Grand Avenue project is finally just the ticket for complete downtown resurrection. But downtown is actually thriving already. It is an unusually large downtown with many distinct districts, and of course, all are not equally thriving. But sensitively designed shelters and other supporting programs are transforming even skid row. The problems of society that are not addressed in Washington or Sacramento or in City Hall, and are left to volunteers, inhabit the places of density and diversity more than the places that are more exclusive. And so downtowns everywhere are the settings for both extraordinary wonders and for desperate plights. Perhaps there has never been a time in human history when this was not the case. The big projects seem to get all our attention. Every mayor and council member, all the prominent reporters and critics, and the men and women of means and influence love them. Architects do too, for professional business reasons, perhaps ego, because such big projects just seem so important. Yet in every good year there are only one or two such projects, and meanwhile there are many average size projects, and an even greater number of small ones. So while we were focused on Staples Center, the Cathedral, and Disney Hall (for 16 years! ), downtown was being transformed by projects here and there and everywhere, remodeling the city center. As an empty retail space was leased, the shops on either side are bolstered. A few street improvements provided a sense of care where there was none before. Twenty projects supported by the CRA, over a period of at least as many years, each included attention to pedestrian walks and amenities until there was a continuous, fascinating, and well-supported path that connected Pershing Square to the Central Library, and up the steps to a mixed-use zone of offices, housing, shops and restaurants, and MOCA and the Colburn School (about to be further expanded) and to Disney Hall and the Civic Center (also in expansion mode) and the Cathedral and perhaps soon to El Pueblo and Union Station and along a hoped for Alameda greenway to Cornfield Park and the River. On another front, so-called artists lofts are a burgeoning commodity, generating more of their kind, and suddenly downtown appears to be rebuilding actual neighborhoods instead of stand-alone residential towers. Such neighborhoods are formed and forming on Bunker Hill, in the historic core, in the financial district, in South Park at last, and in Little Tokyo and Chinatown. And in this context Disney Hall is welcome. MOCA was its predecessor in having a path that moves right through its plaza, making public a museum setting that would normally be more monumentally separate like LACMA?s. And so Disney Hall allows entrance up and over itself from the corners west on 1st Street and south on Grand Avenue. It is a new public park downtown, a perch of a park, up high, looking out over the urban landscape. Busloads of children on school field trips will soon arrive, the children clambering up the steps and over the building and through the garden to the amphitheater in which to hear music from a position high atop the city. How unforgettable will that be as they find themselves among the shiny metal panels in the rooftop park hearing the unfamiliar sounds of the orchestra? Of course, others will be there as well, having brought their lunches, or their love interests, or their grandmothers from one of the valleys. It is unusually provocative and intensely urban, not conventionally urban with little shops and stores, and soft places, rather more challenging – urbanity to stand up to rather than to sink into – no place for faint hearts. But downtown depends more on small and medium size projects everywhere than on a few blockbusters, though the big ones do have a role. They provide the settings big enough and prominent enough to allow us to shout our emotions: a Cathedral in which to mourn Ira Yellin?s passing, and to celebrate what he helped us start; a Staples Center in which to gather for the rituals of sports that are so integral to our culture in which we can be fanatic fans. The big projects have the potential to enlarge how we feel. And so downtown is the lively place of Biddie Mason?s Park, and of a remarkable fashion district, and of amazing Broadway theaters that may well come back to life any day soon. It is the downtown of experimental theater at the Mark Taper Forum, of noontime and evening concerts throughout the summer, and ice-skating throughout the winter holidays. And it may also be known as the world headquarters of the Los Angeles Philharmonic Orchestra and the Los Angeles Master Chorale housed in a hall of such quality that the bar has been raised for every project to follow, both large and small and medium sized. It takes a long time to create a great city, and Los Angeles is still young. But every project counts, and we are beginning to add them up into places and neighborhoods and districts. Robert S. Harris, FAIA, is a professor and urban design consultant. He directs the University of Southern California graduate programs in architecture, was dean of the schools of architecture at USC and the University of Oregon, and has been named a distinguished professor by the Association of Collegiate Schools of Architecture. In Los Angeles, he has co-chaired the Downtown Strategic Plan Advisory Committee and the Mayor’s Design Advisory Panel.